One of the common reasons people claim to support wind and solar technologies is to reduce dependence on foreign sources of energy. For example, green energy supporter Jay Faison told the Wall Street Journal “If we expand our clean energy technologies, we’ll create more jobs, reduce our dependence on foreign sources of energy…”[i] The problem is that green energy actually increases reliance on imports instead of reducing imports. 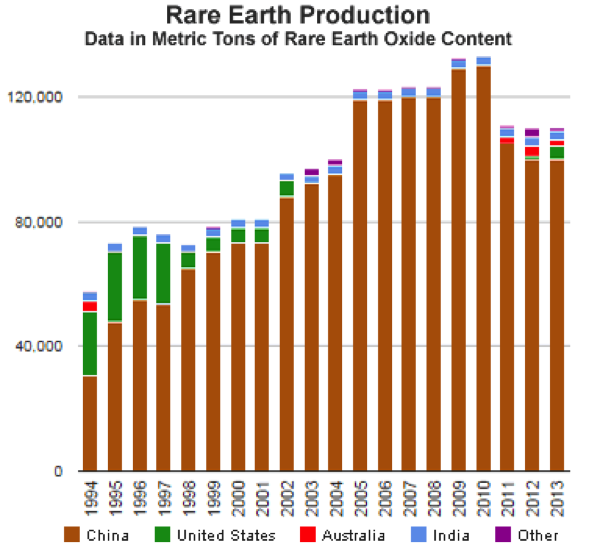 This chart shows China’s dominance in the production of rare earth minerals. China’s dominance may have peaked in 2010 when they controlled about 95 percent of the world’s rare earth production. The country began restricting their rare earth exports, which made prices rise over 500 percent for certain rare earth minerals. That made mining companies in the United States, Australia, Canada and other countries reevaluate old rare earth projects and explore for new ones. Mines in Australia began producing rare earth oxides in 2011, supplying about 2 to 3 percent of world production in 2012 and 2013. In 2012, the Mountain Pass Mine in California came back into production and the United States produced about 4 percent of the world’s rare earth elements in 2013. India has been producing about 3 percent of the world’s supply for the past decade. Indonesia, Russia, Nigeria, North Korea, Malaysia, and Vietnam are also minor producers. With these other countries entering the market, China announced early last year that it would adhere to a World Trade Organization ruling by removing its export quotas and other restrictions on rare earth minerals. [vii] But despite this move and entry into the market of other countries, China remains the dominant producer of rare earth minerals, producing 85 percent of the world’s output and supplying 71 percent of the rare earth imports to the United States, though its share may continue to erode. 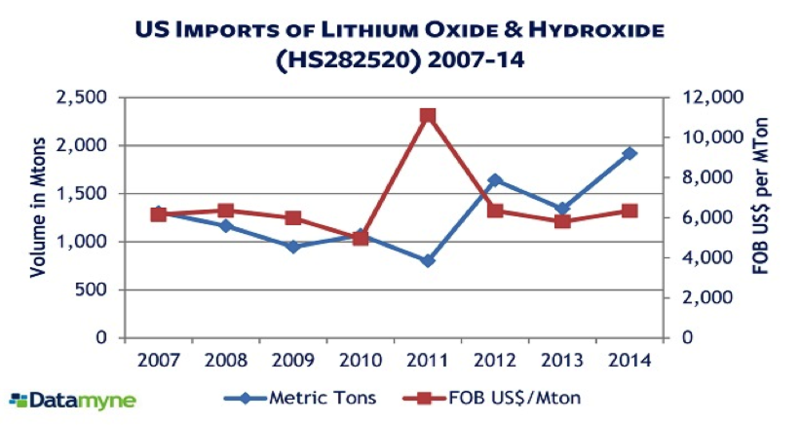 The charts below show the U.S. demand for these lithium compounds and the sensitivity of demand to price increases. Tesla plans to make lithium-ion batteries at its gigafactory near Reno. These batteries will be used in Tesla cars and in Tesla’s Powerwall system for storing electricity from solar energy or off-peak electricity to power homes or commercial building during peak hours of electricity demand. The $5 billion gigafactory is expected to start production this year. Tesla expects that by 2020, the gigafactory would be producing more lithium-ion batteries annually (500,000) than were produced worldwide in 2013. Thus, Tesla needs lots of lithium and relatively soon. As a result, last year, Tesla signed a conditional lithium hydroxide supply agreement with Bacanora, which is developing a mining operation in Sonora, Mexico, and with Pure Energy Mineral, developers of a mining project in Clayton Valley, Nevada. If these two projects are able to get into production, Tesla expects to buy their lithium at a discount to the market price. 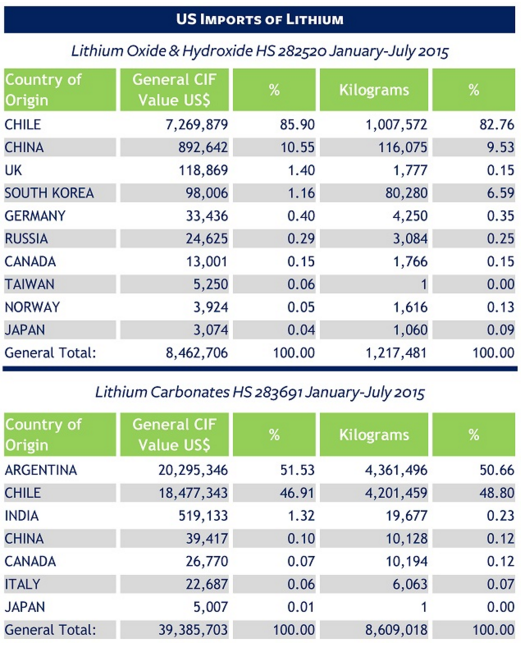 [x] Both of these projects, however, are years from producing lithium. At full production, Tesla will need 17 percent of global supply. To meet the gigafactory’s near-term demand for lithium, Tesla will most likely have to import from one or more of the three major providers, particularly if it is to start producing batteries at the gigafactory this year. The argument that switching to wind, solar, or other “green” technology will reduce energy imports is incorrect. 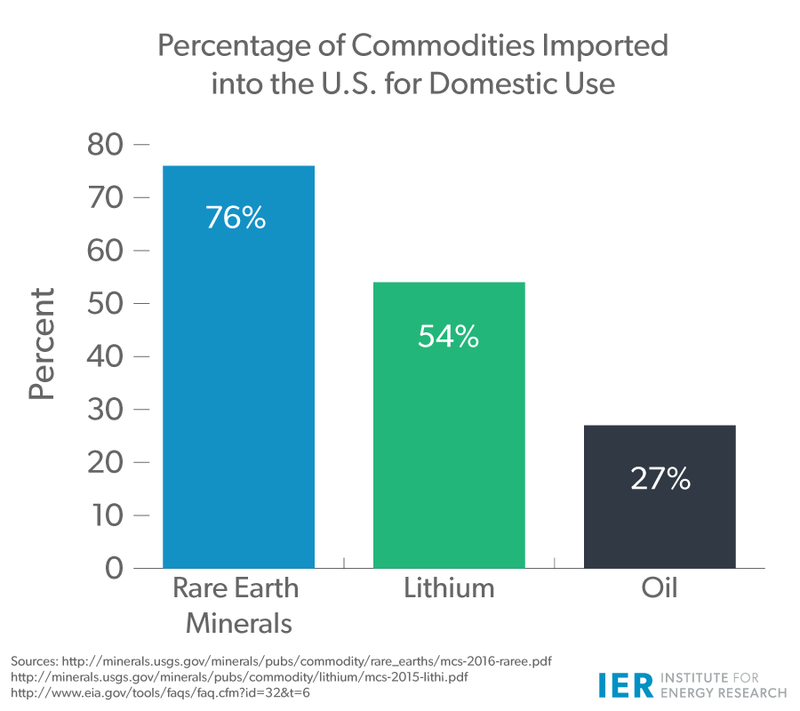 Electric vehicles and other green technologies are dependent upon rare earth minerals and lithium—both of which are mostly imported into the United States currently, at rates of dependence far higher than our dependence on oil imports. 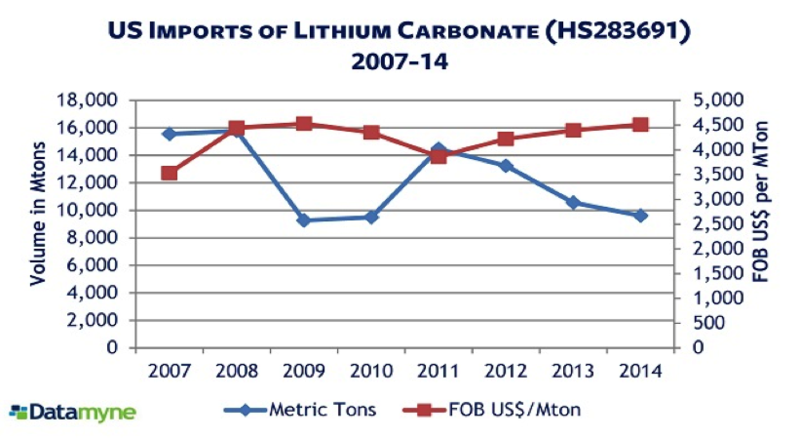 Some even see lithium as the new oil with 90 percent of the market controlled by three companies. Tesla is trying to obtain lithium at below market prices to produce its batteries needed in its electric vehicles and for its Powerwall storage device. It will need to obtain lithium fairly soon since its gigafactory may start producing batteries this year and plans to be at full production by 2020.